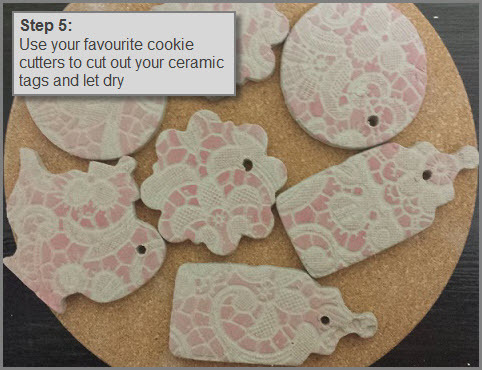 Below is a simple and fun way to use plastic lace with an underglaze to create some cool patterns on clay. 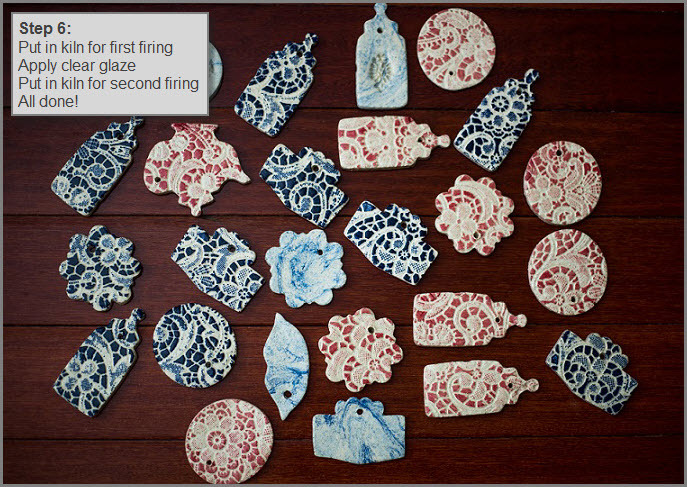 This entry was posted in Ceramics and tagged Ceramics, Clay Pendants, Pottery. Bookmark the permalink. Thanks for the step-by-step tut Rowena. Hot Tamale is one of my favourite Mayco glazes. I don’t know the brand at the right. 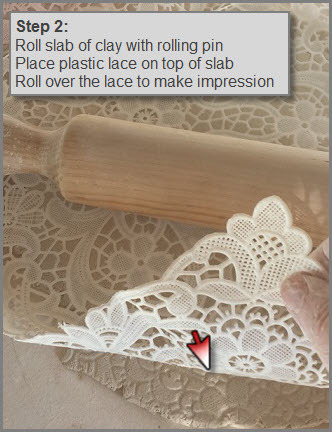 I have bought a plastic lace 1.5 years back and after I had seen your beautiful black lace print bowls (or were those plates?) 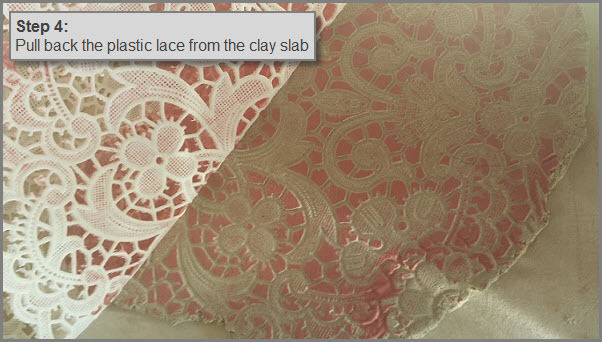 I wanted to make lace prints too. Now with this tutorial I should have a go at it… soon. Hi, thanks. Yes they were white bowls with black underglaze. That was using a different technique to this one. 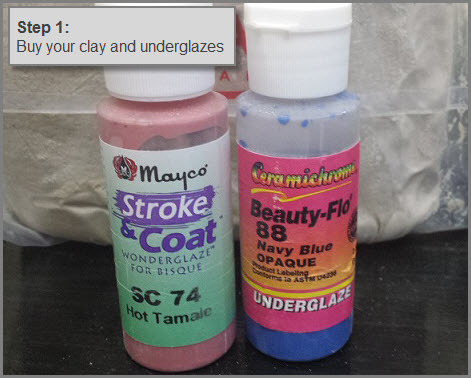 This one allows you to get the colour onto the raised clay whereas those white bowls I used actual lace rather than plastic lace….I applied the glaze after taking off the lace so the glaze went into the crevices and then wiped back the colour on surface. So it all depends on whether you want the colour on the top surface or in the crevices as this will dictate with approach to use. 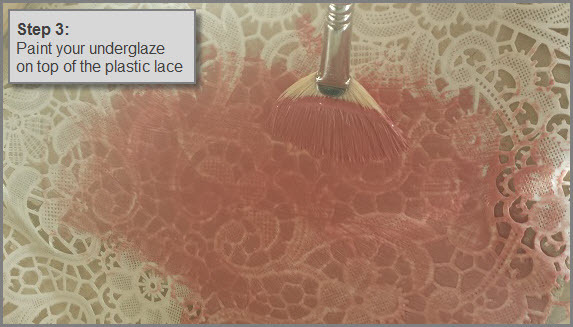 I find it best to use plastic lace if I want the colour on the top surface, but real lace if I want the colour in the crevices. Have I confused you? Anyway, its all experimental and fun. They really look great! To me they have a mosaic feel which I love! Cool. Yes, they have lots of texture to which I like. Oh thanks. I haven’t tried the wax relief method. Off to look up that. I’ll have a look at your to see if you have any examples. Under vintage cups- very time consuming !!! Love this idea – I like how it leaves white pieces. I’ve never fired underglazes in the bisque fire… interesting! Ta. Yeah it’s pretty cool way to apply colour. Thanks for all the tips they look great. I always fire my underglazes in the the bisque firing. I like them to seap into the clay a bit. Wow – they look really cool! Thanks Sharon. Looks like business is going well for you! I find that applying the glaze before bisque firing gives a much richer, true to color result. My instructor says it invites blow ups in the kiln during the firing. What do you think? Oh I have not tried that. Maybe that is why I was instructed to add to bisque.